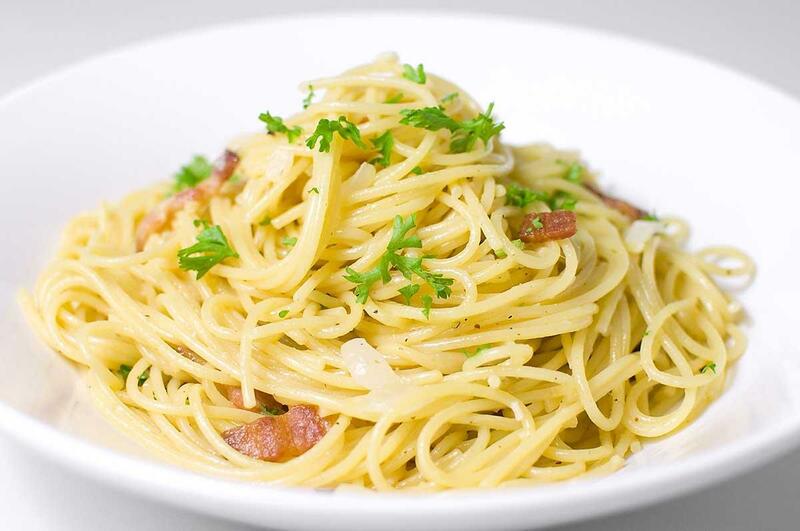 Here is the complete recipe for Spaghetti Carbonara. 1. Bring a large pan of salted water to the boil and cook the spaghetti according to the packet’s instructions. 2. Meanwhile, heat the olive oil in a large, heavy-based frying pan and saute the pancetta until it is starting to crisp and is turning golden brown. 3. Just before the spaghetti is done, scoop out a cupful of the cooking water and set aside. Drain the pasta and transfer to the pan of pancetta. While still on a low heat, coat every strand of spaghetti with the oil and make sure the pancetta is well incorporated. Add a few good twists of black pepper, too. 4. Remove the pan from the heat. Add the egg yolks and parmesan, then stir well with a splash or two of cooking water. Continue until the glossy sauce coats all the pasta strands. 5. Divide equally on to four warmed plates. Add the grated pecorino and a few more twists of black pepper.